Read some of my posts about how I apply eastern philosophy in modern way in order to live a more peaceful life. "Dee brings a comprehensive knowledge of yoga practice and philosophy to her classes. All ages, levels and body types are made to feel welcome. 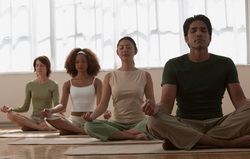 You'll leave class feeling refreshed in the body, soul, and mind and perhaps wiser." "Working with Dee privately as a spiritual coach has brought a lot of powerful changes to my life during a time where I was facing enormous challenges. It has changed my relationship with myself and I am able to see things differently"
"This retreat has helped me reflect on my life as well as given me the tools to help myself in the future. I hope you have it again. I would definitely return. I had a great time"